This is our brand new 2'' Hitch mount bike back carrier for cars, trucks, SUVSor minivans which can haul up to 2 bicycles. It will firmly hold the bikes, soit's perfect for you to carry your bike. Compatible Hitch Receiver Size: 2"
【Stable & Durable】This bike hitch mount is made of heavy-duty cold rolled steel construction, 2" diameter of main support, compatible with any 2" hitch receiver. 2.8mm thick of steel tubes, sprayed with black paint to resist rust and corrosion for added durability. 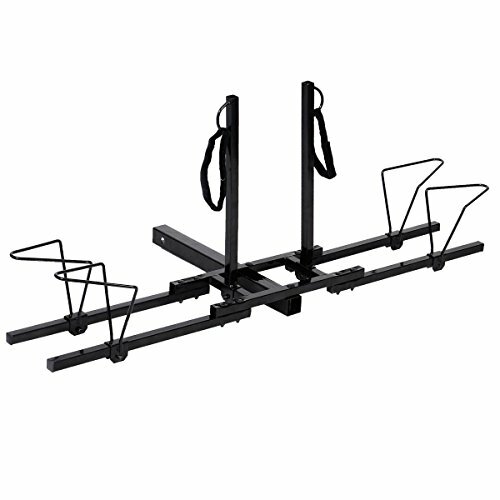 【Easy To Use】This hitch mount could carry up to 2 bicycle quickly and safely. Simply assembled and attached to the receiver hitch and you are ready to start use. Compatible with most bicycle frames with adjustable (sliding) tire fixer and individual ties. 【Portable & Lightweight】 This bike hitch rack mount weights only 19lbs. Easy to lift up with one hand. And it's very convenient for carrying and storage. You can just put it into your trunk when not in use.